The Abelson Scopeworks Hexomniscope is a medium format pinhole camera with six pinholes and shutters. It can take pictures covering nearly 360 degrees. The photographer has to duck under the tripod to stay out of the exposed scene. Each of the six images overlaps its neighbors. However, as each image is flipped during exposure, the resulting image has all the components of the scene, but in the wrong order! Each shutter can be controlled individually so all pinholes don't have to be used in each image. They can be used one at a time, overlapping and blending separate image elements together. 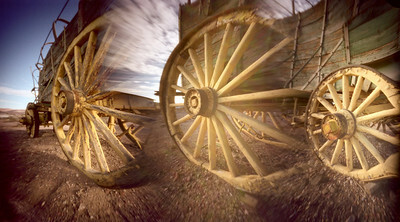 More Wagon Wheels - Multiple individual exposures with three of the shutters not fully engaged. The shutter mechanism is much smoother when all six shutters are used together. Individual exposures require a very firm push on the shutter release plunger, as I learned on this day. Even the mistakes with this camera are fun. 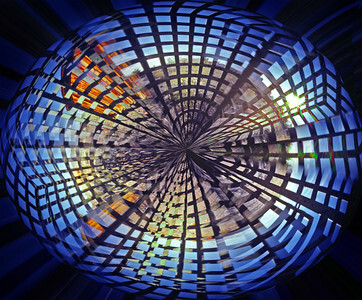 Wheels in the Sky Keep On Turning - Individual shutters were used in this composite images. Actually, two of the exposures did not work properly and this mistake resulted. 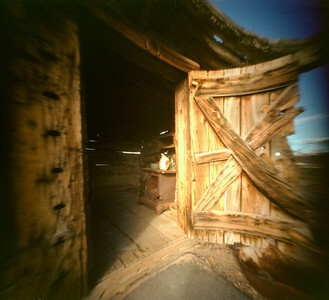 Toll Cabin Doorway - This is a single shutter/pinhole exposure. The shutter only opened half way and this rendition resulted. The curved black area at the top is the shutter. I think it provides a nice framing. 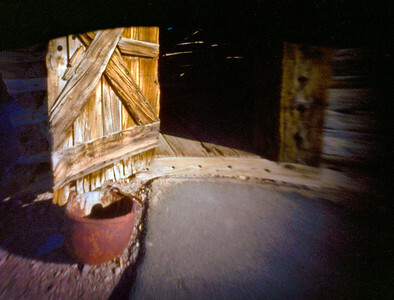 Doorway To The Past - Another single exposure. I like the distortion! I had learned to properly use the shutter plunger by the time I took this image. Prisoner Cage: Let Me Out! - Six simultaneous exposures from inside the Heritage Museum's "Prisoner Transport Cage." Prisoner Cage: Let Me Out 2 - The previous image wrapped with the Polar Coordinate filter in Photoshop. Bristlecone Trail Aspens - About a mile up the Bristlecone Trail in the Spring Mountains is an aspen grove.